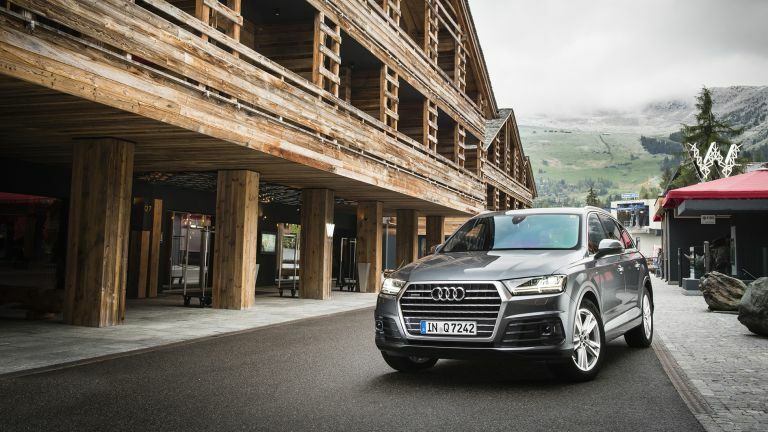 Audi unveiled its new seven-seat Q7 model in the Swiss ski resort of Verbier this week but rather than choosing to drive it full pelt up a black run, the German marque focussed on its tech prowess instead. Audi has clearly got the message that its customers very rarely subject their SUVs to a thorough off-road thrashing, so engineers have looked to pack more cutting-edge tech, luxurious interiors and everyday driving aids into its latest family runaround. Inside, a new 8.3-inch electrically retractable monitor that displays an updated MMI navigation plus system greets customers, while a built-in 4G SIM card ensures the machine is constantly connected to the web. Audi Connect not only creates an on-board Wi-Fi hotspot but also allows the driver to access a number of web-enabled services on the move. Better still, the new system can automatically recognise an iOS or Android smartphone when it is plugged in to the provided USB slot and open up the Apple CarPlay or Android Auto environment in the touch screen. Rear seat passengers will also be able to join on the in-car entertainment party later in the year when the new Audi tablet is offered as an optional extra. The detachable iPad-a-like connects to the MMI navigation plus system via the car's Wi-Fi network, allowing users to access and control the car's radio, media and navigation functions, which is bound to infuriate dads all over the world. On a brighter note, the tablet's Android operating system can also act as a hub for games, eBooks, movies and video streaming services. A new suite of driver assistance aids have also been bolted on to the Q7, including an updated adaptive cruise control that will actually steer the vehicle - as well as accelerate and brake - in slow moving traffic situations. The big bruiser is also more fuel-efficient thanks to an impressive 325kg weight saving over its predecessor. The extensive use of lightweight materials means the 3.0-litre TDI turbo diesel, which produces 268bhp, can return 47.9mpg. A lower powered version of the same engine and a plug-in hybrid model will be more efficient still and available later in the year.